I was 19 years old. My first year at Berkeley, there was no on campus housing, so I rented a room in the Berkeley hills. I took the #7 bus down to campus and returned after dark. Hanging around all day on campus was probably a good thing as it combated the loneliness that I felt very acutely. I had a little radio and “was allowed” to watch TV in an adjacent family room. I rarely did that as I felt I was encroaching on the couple above me, who were my landlords. My little radio picked up a radar signal or some other type of mosquito like sound, so I could only tolerate a bit of that. No telephone, e-mail or other links to the outside world. Happily, I did not lose it. I studied A LOT. I actually read everything I was assigned and sometimes more. I discovered I was intelligent and that was the big learning event for my first year at Berkeley. It was a revelation. After my first year, I managed to get into a dorm and that is where the story really begins. The dormitory was a series of linked World War II barracks. They had been put up to handle returning veterans and as such things go, the barracks stayed. So, in 1962 I lived there with my new friend Malcolm. That first year in the dorm is full of stories, but I am determined to tell just one--- and it only partly in the dorms. I worked in the food service. I had a variety of jobs as a bus boy, dishwasher (my specialty was silverware) and on Sundays, I worked in the Snack Bar which was an old fashioned counter with ice cream and sauce dispensers. I worked the grill and discovered that you get tiny cuts from the popping grease. At the end of a shift, I could wipe my face with a napkin and turn it black. But we truly had fun at the snack bar. Steady now. I need to focus and get to the story. While working for the food service, I met Sarah. 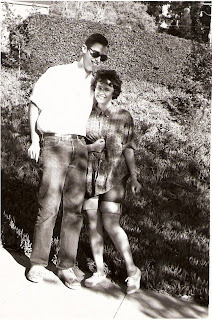 I had not dated much in high school and not at all in college (see above for hermit life in the hills). Sarah made me break out of my troll style life. I knew she was the one. Sarah later told me she dreamed of marrying me very early in this process. She told me that at the time of the dream, she thought I was very weird. One of the reasons she thought I was weird was that she thought my name was Alex. For some insane reason, I told her I was Alex Brown and my friend, Alex, went along with this. I still don’t know why I did this. Part perverse undergrad humor, part shyness, part grand scheme to get her attention. Sarah was very “popular”. Everyone knew her. She was on various student committees and was part of some type of inmate council that ran the women’s dorms. So, as a “popular” girl, I would normally put her in the “don’t bother” classification. But, I was driven to pursue her and I did. In those pre-computer days, if you wanted to know about someone, you went to the lobby of Sproul Hall, (the administration building that looks like the Supreme Court). In the lobby were many file boxes filled with 3X5 cards that contained basic demographics on the students. From this I learned enough about her that I somehow got her entire class schedule. I then took all the same classes. Sarah and I laughed about this story many times and she shared that in today’s parlance she thought I was a stalker. I was everywhere. Eventually, we got to know each other with real names (no more Alex Brown) and I got in to her Physiology 101 lab section. We became lab partners. So, our not quite adolescent romance played out over the large black lab tables where we mutilated various creatures including one prominent rat. The rat was either dead or was very soon dead after we began our work. The big event, was opening the rat’s stomach. Think ick. Think “oooh”. Think don’t breath through your nose. Sarah wouldn’t do it. Although, as life showed me over the next 40+ years, she was much braver than I, on this particular rat stomach issue, she demurred. I cut it open and shortly thereafter had my very first cigarette at Sarah’s urging. She smoked and whipped out her Kent’s and told me that cigarette smoke was vastly superior to rat stench. Telling this story, I realize I have a lot of good stuff to share. Stay tuned. No more rat stories.